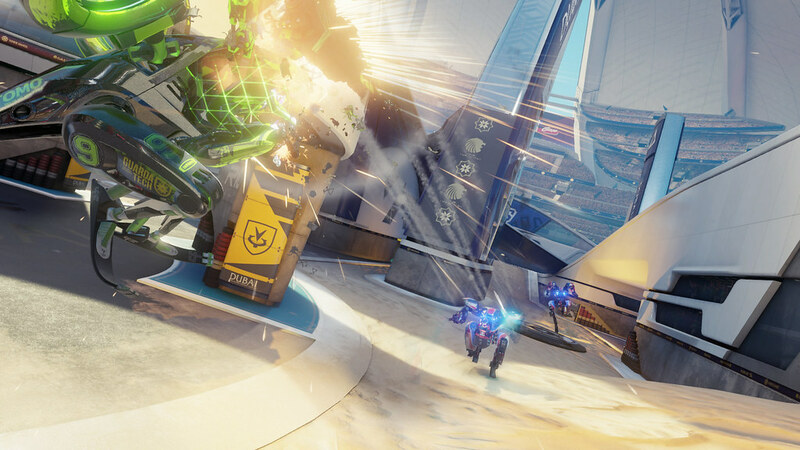 RIGS Mechanized Combat League is at Paris Games Week with a brand-new playable arena. 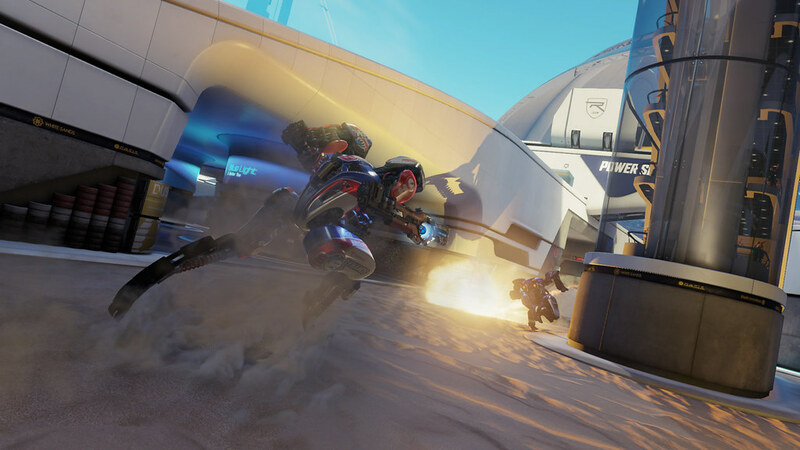 For the uninitiated, RIGS is a competitive first-person arena shooter currently being developed for PlayStation VR by Guerrilla Games Cambridge. The eponymous ‘RIGS’ are piloted, highly-tuned, athletic machines that compete in the global sport of the future. 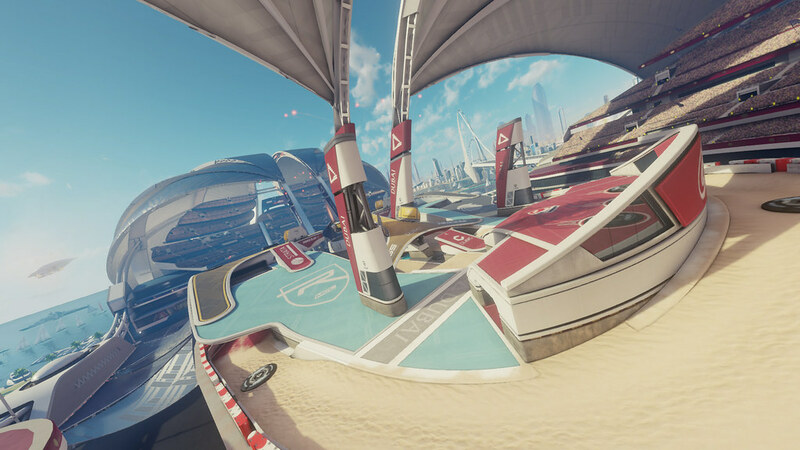 Located in the gorgeous city of Dubai, the new stadium is much larger than Rio, the arena previously shown at E3. 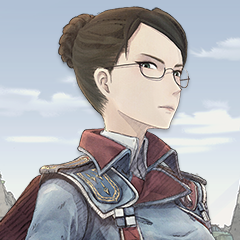 With more open areas and a symmetrical layout, this is a brand new way to experience Mechanized Combat. For a look on how the new Stadium feels here is the trailer. We caught up with Art Director Tom Jones and Senior Artist Laura Dilloway to talk about the Dubai stadium, its inspirations, design considerations, and impact on player tactics. Hi Tom and Laura! Please tell us a little bit about the new Dubai Stadium. Tom: The Dubai arena is a huge, custom-built stadium with soaring stands and wide views of the city. We wanted it to feel at home amongst the scale and lavishness of Dubai, so the whole stadium is designed to be awe-inspiring. It’s deliberately clean and bright, with crisp white flowing structures and calm blue skies. The stadium floor is partly covered with sand, to further strengthen the ties to Dubai and offer a unique natural element to shoot other RIGS in. You evolved the Rio skyline to match your vision of the future. Did you do the same for Dubai? Tom: Absolutely. 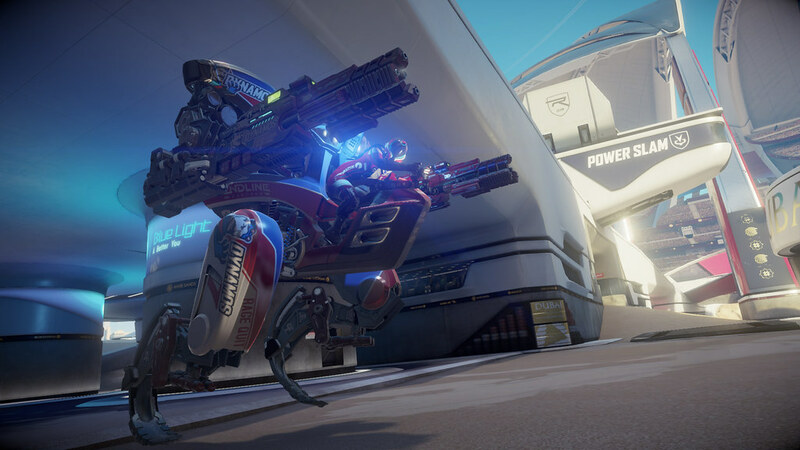 RIGS: Mechanized Combat League is set 50 years in the future, so we thought of various ways to update the already-impressive architecture. Among other things we added a huge space elevator to the skyline, to serve as a key landmark and another testament to human endeavor. Where is the Dubai stadium located geographically? Laura: The stadium has its own island just off the coast! One of the most defining features of Dubai – aside from the impressive architecture that Tom mentioned – is the fantastically-shaped manmade islands. It’s a perfect fit for the location of the Dubai stadium: not only does it convey the huge wealth of the city, but it also hints at how popular RIGS is as a sport in 2065. Aside from the manmade islands, what were some of the other inspirations for the stadium? Laura: The Dubai we know today already boasts some of the most advanced structures in the world, so we didn’t have to look far for inspiration. Something we really loved were the beautifully landscaped gardens that accompany these structures, like the one at the Burj Khalifa. We then started looking at huge stadiums and sports parks from around the world, including the 2012 Olympic Park in London, to see how we could marry these ideas together. Compared to Rio, how does the size of this arena affect the PowerSlam game mode? Tom: The arena may be bigger, but the structures are still designed to guide the player around the Dubai stadium in a very natural way. All large ramps ultimately lead towards the central goal, which makes routing very obvious. The ramps themselves are integrated into the overall architecture, which allows them to hold large banks of spectators. This creates both a fantastic sense of scale and a consistently immersive sporting experience. Are there any tactical changes that a player needs to consider when playing in this stadium? 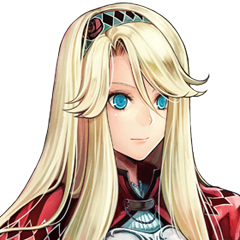 Laura: The biggest tactical change is probably that picking your spawn points carefully is more important in the Dubai stadium. For example, you can spawn very close to the goal, but you’ll be quite exposed – so you have to consider if it’s worth the risk. If you’re happy out in the open, then using melee as a boost to jump between the large structures is also really useful. On the other hand, if you prefer a more stealthy approach, there are a lot tunnels under the stadium that allow you to circle around your opponents and come at them from unexpected directions. Were there any lessons from the Rio arena you were able to use to your advantage for Dubai? Tom: Definitely. We gained a lot of experience during the creation of our Rio arena with regards to how best to create a readable world for VR. We also established a lot of our sporting tropes, which we have carried through into the Dubai arena. Laura: A good example is highlighting the routes up to the goal in yellow, which is something we did in Rio as well. We’re also largely using the same materials for our playing surfaces, and we’ve created fictional sponsors that advertise globally across all the stadiums – in addition to more location-specific sponsors. You’ve unveiled Rio and Dubai thus far. Can we expect more global cities as backdrops for RIGS arenas? Tom: Yes, for sure! We’re very keen to look at other cities and continents to house our stadiums. 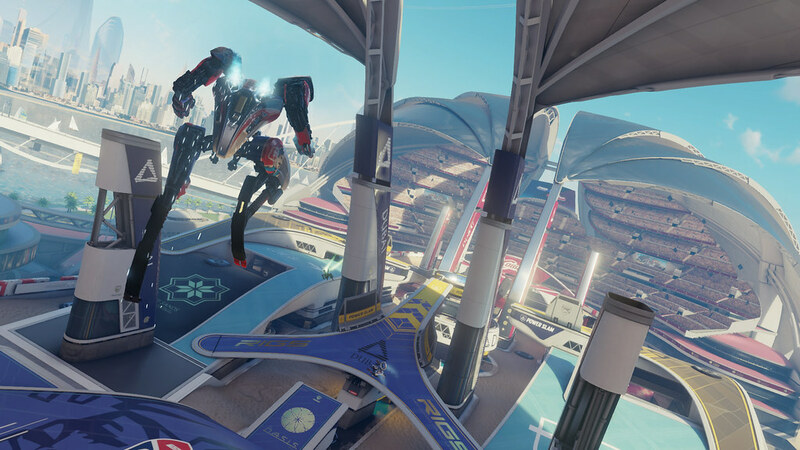 Ultimately, RIGS Mechanized Combat League should feel like a global sport, so it’s important to us that we cover different cultures and styles of arenas. If you’re at Paris Games Week, be sure to try out RIGS Mechanized Combat League on PlayStation VR for yourself! If you happen to be one of the lucky ones who have already played the Rio level then look out for the new play experience offered by the Dubai arena. 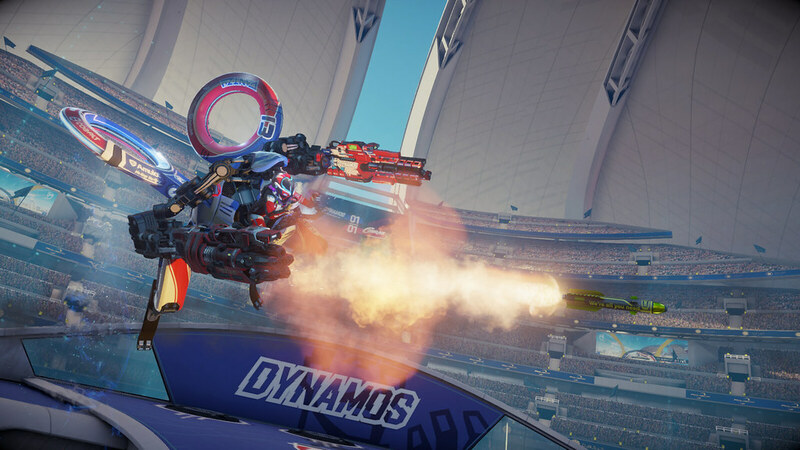 For more news on the development of RIGS Mechanized Combat League, including upcoming events where the game will be playable, keep an eye on PlayStation Blog and on the official Guerrilla Twitter account. Going to be the best thing since Rocket League. When is this coming out and how much is it going to be, it looks so awesome!